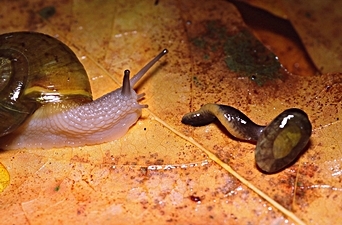 The European glass snails by no means are the only terrestrial snails on the evolutionary path to becoming a slug. The Helicarionidae family for example is distributed in the Eastern Palaearctic (see Faunal provinces of the Earth), Malagasy (Madagascar), India, Southeast Asia and Australia. While the family name was derived from the genus Helicarion, which has gone a long step in vitrinisation, there definitely are other species which still possess a complete exterior shell. On the other hand, the genus Parmarion has a rather weird hunchback appearance, because its shell is completely overgrown by the mantle. Dromedary jumping slug (Hemphillia dromedarius). Also remarkable is the fact that the Helicarionidae family produces a love dart made from chitin, not from calcium carbonate, like in helicid snails (Helicidae). Different degrees of vitrinisation can also be observed in the jumping slugs of the American Northwest. Like Parmarion, they also have a hunchback appearance, because their shell is at least partially overgrown by the mantle. Fittingly, Hemphillia dromedarius is called the dromedary jumping slug, because it looks like a camel. 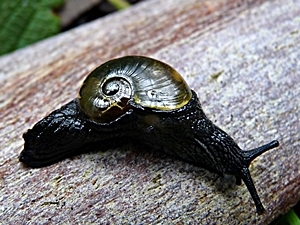 The name jumping slugs (though those gastropods still have a shell, only it is partially overgrown by the mantle, in English they are still called slugs) is due to a very special behaviour those snails use to save themselves from other predatory snails, such as the robust lance tooth (Haplotrema vancouverense): They jump, or to be more exact, they perform a rolling motion, so they fall off the tree log, thus gaining a potentially life-saving head start. bust lance tooth (Haplotrema vancouverense, on the left). 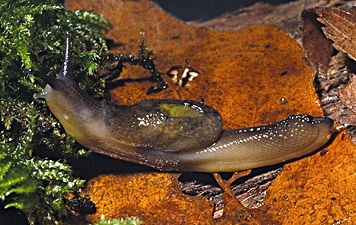 Apart from predation by other snails, by beetles and salamanders, the severest danger to the Northwest American jumping slugs is the destruction of their habitats. Even the most acrobatic jumps will not help them there. The Nature Conservancy: The secret life of jumping slugs. Jumping slug acrobatics. Movie by Kristiina Ovaska on YouTube. By the way, jumping slugs are classified as Arionidae, a family, to which also belong the European round back slugs. Most remarkably, those have reached such a degree of vitrinisation that all that is left of the shell are some calcareous grains below the mantle. There certainly are numerous other gastropod species, where like in Hemphillia, the shell can gradually be seen overgrown by the mantle. There are also slugs, which do not look like the European slugs with the mantle making only the frontal part of the animal resembling a shield. For example, the North American slug Megapallifera mutabilis (Philomycidae family) has the mantle covering all of the body (which is why it is called Megapallifera, meaning "the bearer of a giant mantle"). Also other gastropods of the Veronicellidae family look like a giant walking mantle, even the tentacles barely look from beyond it. To the European visitor, accustomed to Arion, Limax, Milax and Deroceras slugs all looking alike, this of course is an almost alien-like view. Megapallifera mutabilis from Texas: Picture by Paul J. Morris.